What is decision intelligence? How does it tie into the world of data science? And what does Google have to do with it all? Click on the above SoundCloud link and find out! 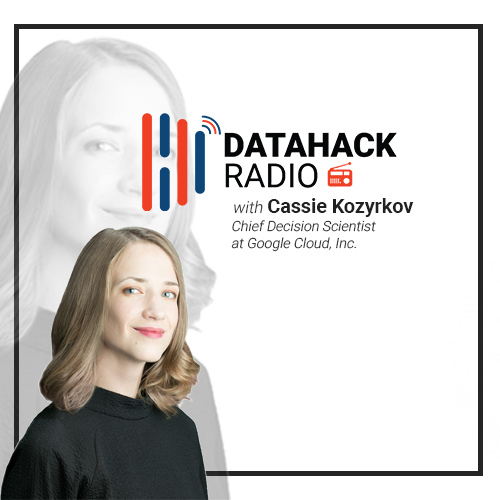 Welcome to episode #11 of DataHack Radio, where we were joined by Google Cloud’s Chief Decision Scientist, Cassie Kozyrkov! Cassie is a well-known speaker in the data science sphere, and often pens down her thoughts in articulate fashion in this field. She takes us on a journey into her life at Google and how she went from being a Statistician at Google to her current role. This is a short summary of Cassie in conversation with Kunal. Give the podcast a listen and find out how a top Google scientist thinks, works, and structures her thoughts! As a bonus, there are some brilliant quotable quotes in this episode, which you will find yourself chuckling and nodding to. The story behind Cassie’s shift from using MATLAB to R is a fascinating one. While working with MATLAB, she wanted to make a particular kind of chart. After spending hours trying to figure it out, she decided to try her hand at R.
It took her half an hour to design the plot she wanted! And the rest, as they say, is history. She’s a big R fan, and turns to Python if absolutely necessary. Cassie joined Google in 2014 as a Statistician and one of her early projects was getting rid of duplicate entries in Google Maps. It was a far more challenging task than one might think. How do you actually define duplicate entries? You need to define good processes for measuring and verifying each duplicate entry. On a global scale, this is not a straightforward task. There were a lot of statistical techniques involved in this process, like hypothesis testing. But she wasn’t the only statistician on board this project, which meant coordinating and collaborating with others. Just getting people to agree on one definition of a duplicate entry was a long winding process (anyone who has worked on a project staffed with over 50 employees will be able to relate to this!). Decision Intelligence (DI) augments data science with theory from social science, decision theory, and managerial science, among other applications. DI provides a framework for best practices in organizational decision-making and processes for applying machine learning and AI at scale. Cassie finds herself these days working on multiple projects, especially in the initial stages. This way she can assign the task of particular things to the correct people, instead of letting projects get bogged down due to teams not being aware of what the next step should be. If you just rely on data science in a project, the whole thing just might flop. You need to add some extra muscle, which decision intelligence supplies. This is quite a fascinating concept and worth listening to in the podcast. She also aims to help the outside world (outside Google, that is) do some of this stuff, in a more organised and better manner. Check out some of her talks in various global forums to get an idea of what she means by that. What Cassie means by the above quote is that when you start thinking about it as holy water, it instantly means it’s accessible only to a select few. This is absolutely not true for AI and there’s no special magic attached to it. “Think of it as a different way of communicating your wishes to a computer.” You can use it to power your business and improve your results, without needing to rely on intuition and good old luck. Cassie encourages everyone to explore programming and machine learning, at least at a basic level. It’s such a wonderful gateway to a whole new world where you have the power to change results, so why shouldn’t you leverage that? Coming to the future of this field, Cassie is most excited about the applied side of machine learning and AI. She uses her popular analogy of a microwave and other kitchen appliances to explain this – a truly innovative way of thinking about this domain! I personally had only vaguely heard about decision intelligence before listening to this podcast, so it was quite an eye-opener. It’s a intriguing discipline and one I feel anyone in the data science field should explore. This is one those podcasts you just don’t want to end, it has so much knowledge packed into an hour! I hope you enjoy listening to it as much as I did. Good job putting up these awesome interviews guys ! !